There are several ways that corals obtain energy. In this unit on coral feeding, we will learn what corals eat, how they feed, and additional ways that they obtain energy. Corals are sessile, meaning they cannot move to get food. Instead, they stick out tentacles to catch prey items like zooplankton (animal-like organisms that live in aquatic environments) and other food particles. 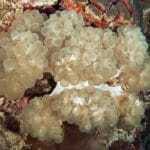 The prey is dependent on the size of the coral polyp. After catching their prey, corals use their tentacles to place the prey into their mouths. Corals are carnivorous. However for the first time ever, in 2009, scientists observed mushroom corals (Fungia scruposa) feeding on their cousins, the moon jellyfish (Aurelia aurita). This is really unique considering most corals feed on small microscopic organisms and not moon jellyfish that can reach around 12 inches (30.5 cm). These solitary coral polyps can reach up to 11.8 inches (30 cm) meaning that they have much larger mouths then most polyps. Scientists are still perplexed at how these corals catch the jellyfish. Source: Alamaru, A., Bronstein, O., Dishon, G., and Loya, Y. 2009. Opportunistic feeding by the fungiid coral Fungia scruposa on the moon jellyfish Aurelia aurita. Coral Reefs 28(4): 865. When can you observe corals feeding? Most corals feed at night, due to the availability of their food source. Zooplankton have specific movements called diurnal vertical migration (figure 4-1). Diurnal refers to a twenty-four hour period. Organisms such as zooplankton move vertically to the surface of the water at sunset. Once the sun begins to rise, the zooplankton move back down to deeper water. Figure 4-1. Zooplankton are near the bottom sediments during the day (left). They migrate up near the surface of the water to feed at night (right). During the day, zooplankton hide in deeper water to avoid predation. 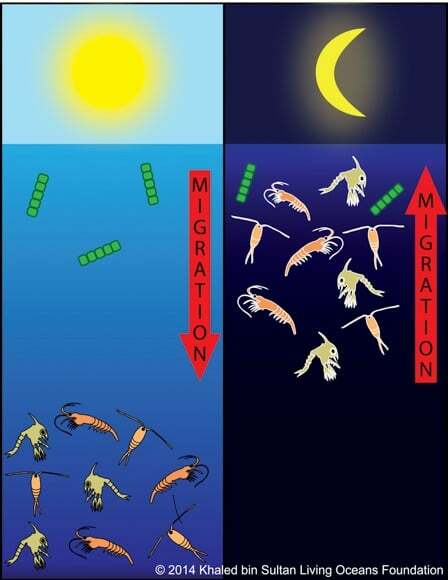 At night they migrate towards the surface to feed on phytoplankton (microscopic plant-like organisms), which remain in shallow water and do not vertically migrate. It is during this time that corals feed on vertically migrating zooplankton. Have you ever seen small flashes of light coming from the ocean at night? No, your eyes are not playing tricks on you. If you saw the light, then you have probably seen bioluminescent zooplankton. Just like lightning bugs, zooplankton create light energy (the light you see) when a chemical reaction occurs that produces a pigment known as luciferin. This is known as bioluminescence. There are many animals in the ocean that are bioluminescent. They use light for a variety of reasons including attraction, defense, communication, warning, and mimicry. Check out this small video by National Geographic here. In addition to catching prey with their tentacles, most corals also have an outer mucus layer that aids in transporting prey to the gastrovascular cavity for digestion. In fact, some corals have few to no tentacles and therefore can only feed by drawing the mucus into their gut by tiny cilia (hair-like projections) that cover the coral (see Unit 3: Coral Anatomy). Prey items that might be caught by mucus include dissolved nutrients from the water and sediment. In particular, dissolved organic matter (DOM) forms an important food source for many corals. Marine DOM is a mixture of organic molecules that are found in seawater. Organic molecules contain both carbon and hydrogen atoms. Examples of DOM include amino acids, sugars, and lipids. Additionally, corals take up inorganic matter, which are elements or compounds that don’t contain either carbon and hydrogen atoms. Corals take up inorganic compounds including calcium, magnesium, potassium, gases such as oxygen and carbon dioxide, and other elements. Inorganic matter is a critical component in the production of the coral’s skeleton. Sediment (sand, fragments of rock, organic matter, and other small particles) can also be an important food source for corals. This sediment is trapped by the mucus, ingested, and digested (Wild et al. 2004; Huettel et al. 2006). It can contain bacteria, protozoa (motile, unicellular eukaryotic organisms), microscopic invertebrates, microalgae (microscopic algae), and organic matter. Corals produce an abundant amount of stringy strands of goo, sometimes referred to as “coral snot.” This goo is a layer of mucus covering the outside of the coral polyp that aids in its protection, capture of food, and removal of sediments and waste. Coral mucus has even been found to have sunscreen-like properties. Just like we wear sunscreen to protect our skin from harmful UV rays, corals use mucus to protect their bodies – coral snot SPF! 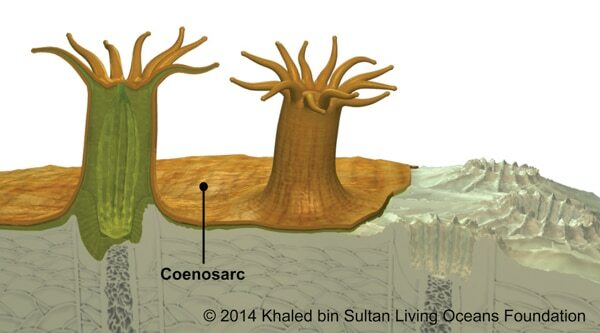 Recall from Unit 3: Coral Anatomy that colonial corals have a connective tissue called coenosarc (figure 4-2). 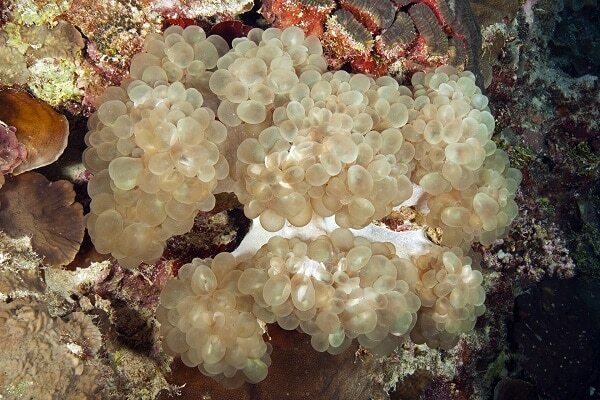 This tissue allows coral polyps to share this food with each other. Additionally, corals have a predatory mechanism called nematocysts that aid in feeding. Recall from Unit 3: Coral Anatomy that nematocysts are stinging cells located in the tentacles. Other organisms in the Phyla Cnidaria including some anemones, jellyfish, and hydra, also possess these stinging cells. Glutinant: nematocyst has a sticky surface that is used to stick to prey. Penetrant: nematocyst has a harpoon-like structure that is used to penetrate the exoskeleton (hard outer covering) of prey. Volvent: nematocyst has a lasso-like thread that is used to wrap itself around its prey. The following example describes the firing of a penetrant nematocyst (figure 4-3). Each nematocyst is encapsulated in the tissue of the ectodermis. The thread (a rope-like structure) is coiled around the barbs and held in place by pressure from the flap, called the operculum. This is similar to a jack-in-the-box; the pressure of the lid holds the jack in the box. The cnidocil is a hair-like projection located externally near the operculum. When stimulated, it acts like a trigger and the operculum opens. 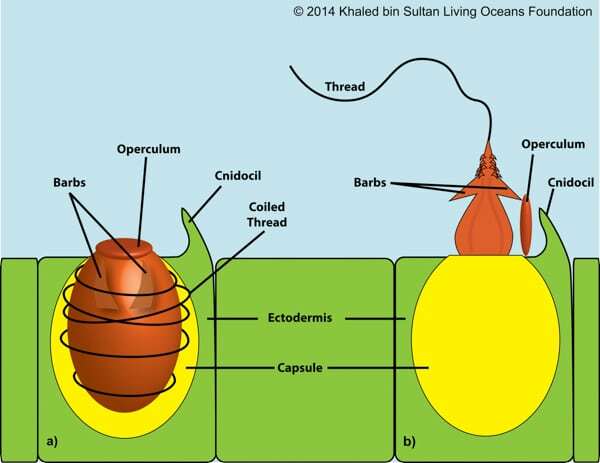 Like a harpoon, the barbs shoot out of the capsule, unraveling the coiled thread, and impaling or wrapping around the prey item. The barb contains toxins that also subdue its victim. These stinging cells are mostly harmless to humans, but are lethal to smaller prey items like zooplankton. You now know that animals in the Phylum Cnidaria possess nematocysts. Using a specialized camera, scientists found out that a nematocyst fires in almost 700 nanoseconds! A nanosecond is one billionth of a second. That’s really fast. In this time period, the nematocyst travels at an acceleration of 5,140,000 g (g-force). To give you a little perspective, a space shuttle’s maximum acceleration on take-off is 3 g. Nematocysts are one of the fastest known cellular processes. Source: Nüchter, T., Benoit, M., Engel, U., Özbek, S., and Holstein, T.W. 2006. Nanosecond-scale kinetics of nematocyst discharge. Current Biology 16 (9): R316-R318. Zooxanthellae are yellow-brown, single-celled algae that live in the endoderm of the coral polyp (figure 4-4). The zooxanthellae can give the corals their color. Without them, the polyps would be clear, just like jellyfish. However, there are some corals that have tissues with orange, yellow, green, blue, red and purple pigments. The pigment colors can vary depending on the reflection of the light. 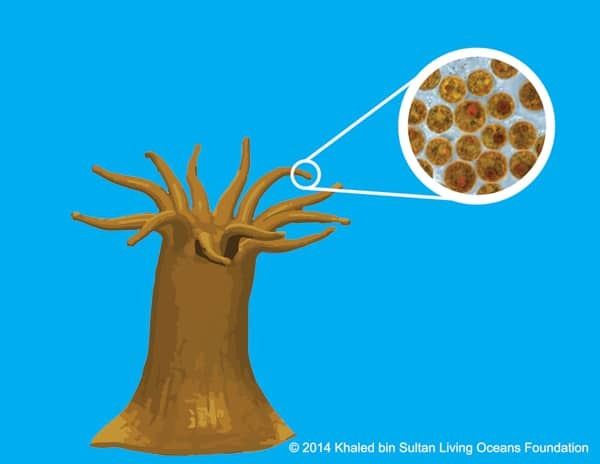 Most corals are yellow-brown due to the zooxanthellae that are living inside of them. The color comes from the photosynthetic pigment called chlorophyll. Why do we see brightly colored corals such as pink, orange, purple, blue and green? The answer is pigments and proteins. Besides chlorophyll, zooxanthellae can produce other photosynthetic pigments that can produce a myriad of colors. Corals are also responsible for producing color. They are able to produce fluorescent proteins and non-fluorescent chromoproteins that give off a variety of colors. Before we dive into this relationship, let’s take a closer look at symbiosis. Mutualism: when both organisms benefit (figure 4-5). Parasitism: when one organism benefits and the other is harmed. Commensalism: when one organism benefits and the other is neither benefiting nor being harmed. Obligate symbiosis: when organisms require the relationship to survive. Facultative symbiosis: when organisms can survive without the relationship, but it increases the chances of survival. Endosymbiont: living inside another organism. Ectosymbiont: living on the body of another organism. There are many different symbiotic relationships that occur in the coral reef ecosystem. Figure 4-5. a) Anemones and clownfish have a mutualistic relationship. 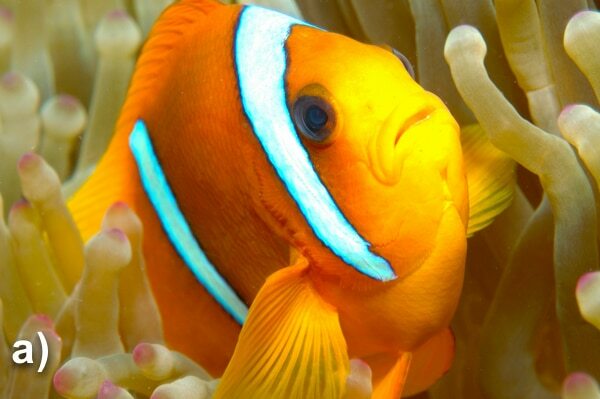 The clownfish gets protection from the anemone and a home and the clownfish wards off predators and drops pieces of food for the anemone. b) Cleaner shrimp and eels have a mutualistic relationship. 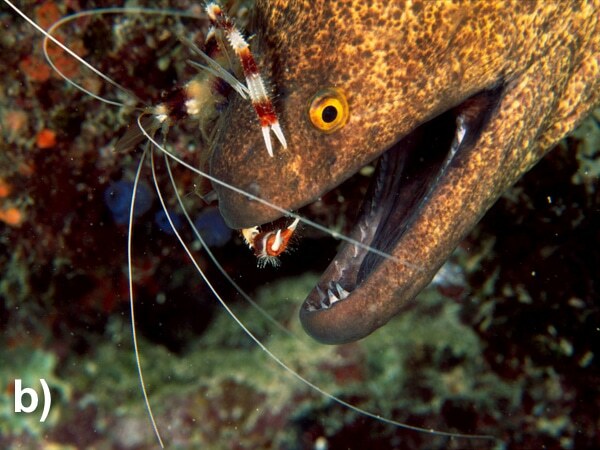 The eel benefits by getting rid of parasites, while the cleaner shrimp makes a meal out of these parasites. c) Guard crabs and Pocillopora corals have a mutualistic relationship. Guard crabs are thought to defend the coral against predators such as snails that prey on the coral (Stier et al. 2010). The coral, in turn, provides food and shelter for the crab. Some organisms may fit into one or more categories of symbiosis. There are three forms of symbiosis that exist between corals and zooxanthellae. First, corals form a mutualistic relationship with zooxanthellae; both organisms benefit. Second, zooxanthellae are also considered endosymbionts because they live inside the tissues of the coral polyps. Finally, they have an obligate symbiotic relationship; corals require this relationship with zooxanthellae to survive. Can you think of some ways that the corals and zooxanthellae may benefit each other? Remember that corals prefer low nutrient water, meaning there is less phosphorus and nitrogen present. Corals are able to pass the waste products of phosphorus and nitrogen to the zooxanthellae and vice versa. Each recycles these nutrients in different ways. 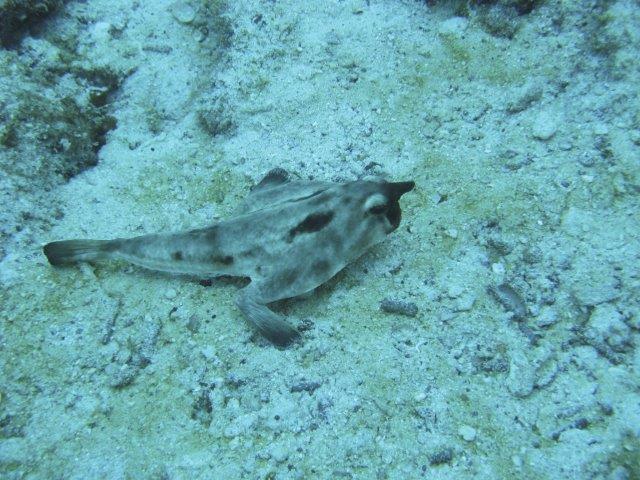 Do you recognize this animal? Yep, it is an animal. In fact, it’s coral! Corals in the genera Physogyra and Plerogyra are sometimes referred to as the “bubble” or “grape-like” corals. These corals have a unique feeding strategy. They can fill their tissue with water, expanding it into a “bubble.” Their tissues also contain zooxanthellae. When they expand their tissues, they are increasing surface area, allowing for the zooxanthellae to obtain the greatest amount of light. In turn, this creates more food for the coral. Zooxanthellae are important in helping the corals produce the calcium carbonate that they need to create their skeletons. We will learn about this process in Unit 9: Coral Growth. Additionally, algae receive a safe place to live. During sexual reproduction, there are two ways that corals can incorporate the zooxanthellae in their tissues. The first way is by closed-system transmission. This occurs when the coral transfers zooxanthellae directly to their offspring. The second way is through open-system transmission where the polyps must retrieve zooxanthellae from the surrounding ocean waters (Dubinsky 2011). Corals do not make their own food. Instead, they receive the byproducts of photosynthesis from the zooxanthellae. In fact, up to 95% of these byproducts (Falkowski et al. 1984) are transferred from the algae to the coral. These byproducts include oxygen and food in the form of glycerol, sugars, organic acids, amino acids, lipids, and polyunsaturated fatty acids (Dubinsky 2011). In return the zooxanthellae receive the byproducts of cellular respiration (carbon dioxide). These two processes will be described below. When we put this word back together, it means to make with light. Photosynthesis is the process that plants or other organisms use to convert light energy into chemical energy. What about energy? Energy is not matter; therefore, it is not considered a reactant. Energy is included with the reactants here to show that it is necessary for the reaction to take place. Sunlight is the energy required for photosynthesis to occur. What do plants require so they can survive? That’s right! They need carbon dioxide, water, and sunlight. Did you notice that all of these are reactants in the photosynthesis equation? What are the plants and other photosynthetic organisms making with light? They make glucose, a sugar that organisms use as a source of energy. They also make oxygen, which is then released into the atmosphere and used by other organisms, such as humans. Organisms use the sun’s energy that is stored in glucose to charge their molecular batteries. This battery is called ATP, short for adenosine triphosphate. ATP consists of adenosine (the sugar ribose attached to the base adenine) and three phosphate groups. Energy is stored in the bond between the last two phosphate groups (figure 4-7). When an organism needs to use energy, like when a human is playing baseball or a plant is growing tall, this bond is broken and a phosphate is released. The new molecule is called ADP, short for adenosine diphosphate (di-, instead of tri-, since there are only two attached phosphates now). 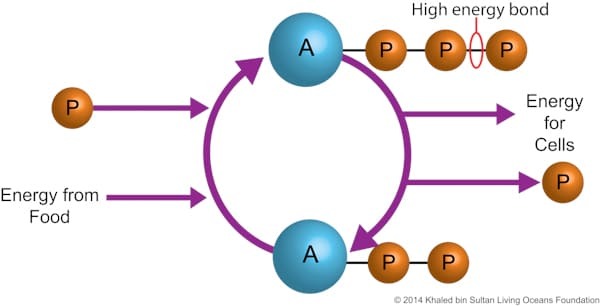 When a new source of glucose comes along, a phosphate is put back onto ADP, reforming ATP. Now, the battery is charged again, ready to go. Figure 4-7. ATP is constantly converted into ADP in all organisms. Energy is released when the high energy bond is broken. All living organisms perform cellular respiration. Plants use some of the glucose they have produced to undergo this process. Organisms that cannot perform photosynthesis have to eat other organisms in order to obtain glucose. When glucose is broken down, it releases energy, which is then used to re-bond phosphate to the ADP molecule (recharging it, making ATP). Glucose is not the only reactant. Oxygen is usually present for this reaction to take place. To release energy during cellular respiration, glucose (C6H12O6) and oxygen (O2) are broken apart, rearranged, and formed into carbon dioxide (CO2) and water (H2O). How do plants create glucose? That’s correct! They make glucose by photosynthesizing. Take a look at the equations below. Notice that the reactants for photosynthesis (in blue) are the same as the products for cellular respiration (in blue). Cellular respiration produces the molecules needed to perform photosynthesis. Next, look at the orange part of each equation. The products of photosynthesis are the reactants needed for cellular respiration to take place. Therefore, photosynthesis and cellular respiration have a cyclical relationship. Now does it make more sense that corals have such a close symbiotic relationship with zooxanthellae? Corals produce carbon dioxide during cellular respiration. They pass this gas to zooxanthellae, which use it to photosynthesize. One of the products that zooxanthellae create during photosynthesis is oxygen. Corals use the oxygen created during photosynthesis for cellular respiration. Corals are animals and they cannot produce glucose on their own, zooxanthellae can. 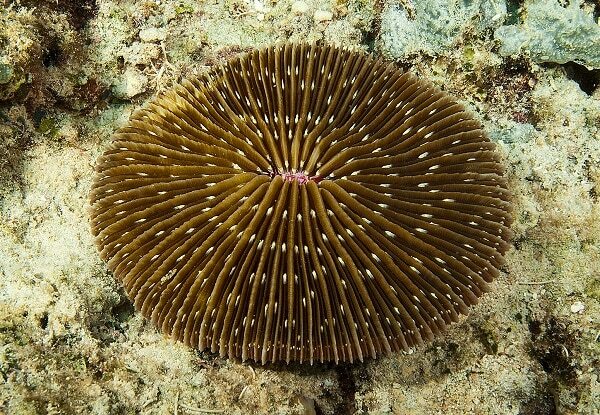 Through the process of photosynthesis, zooxanthellae create glucose and share some of it with the coral. This is why most corals live in the euphotic zone, so they have access to sunlight. 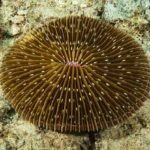 It’s easy to see that this unique symbiotic relationship between coral and zooxanthellae strengthens life-sustaining processes. Figure 4-1. Copepod Adapted from Kils at the English language Wikipedia [GFDL (www.gnu.org/copyleft/fdl.html), CC-BY-SA-3.0 (http://creativecommons.org/licenses/by-sa/3.0/) or GFDL (www.gnu.org/copyleft/fdl.html)], 21 October 2004 via Wikimedia Commons. https://commons.wikimedia.org/wiki/File%3ACopepod.jpg. Figure 4-1. Zoea Adapted from Obsidian Soul (Own work) [CC BY-SA 3.0 (http://creativecommons.org/licenses/by-sa/3.0)], 3 September 12 via Wikimedia Commons. https://commons.wikimedia.org/wiki/File%3AOregonia_gracilis_Zoea_II.png. Figure 4-1. Shrimp Adapted from Andrew c at the English language Wikipedia [CC-BY-SA-3.0 (http://creativecommons.org/licenses/by-sa/3.0/), GFDL (www.gnu.org/copyleft/fdl.html) or CC-BY-SA-3.0 (http://creativecommons.org/licenses/by-sa/3.0/)], 7 October 2006 via Wikimedia Commons. http://commons.wikimedia.org/wiki/File%3AShrimp.svg. Figure 4-4. Zooxanthellae Adapted from Allisonmlewis (Own work) [CC BY-SA 4.0 (http://creativecommons.org/licenses/by-sa/4.0)], 21 February 2015 via Wikimedia Commons. https://commons.wikimedia.org/wiki/File%3ASymbiodinium.png. Figure 4-7. Adapted from Hobbs, B. (25 May 2011). Renewable energy: you’re soaking it up (ATP graphic). Retrieved from http://www.abc.net.au/science/articles/2011/05/25/3226741.htm. Falkowski, P. G., Dubinsky, Z., Muscantine, L., & Porter, J. W. (1984). Light and the bioenergetics of a symbiotic coral. Bioscience 34: 705-709. Dubinsky, Z. & Falkowski, P. (2011). Light as a source of information and energy in zooxanthellate corals. In: Dubinsky Z. & Stambler N. (eds.) Coral reefs: an ecosystem in transition, Springer, Dordrecht. Huettel, M., Wild, C., & Gonelli, S. (2006). Mucus trap in coral reefs: formation and temporal evolution of particle aggregates caused by coral mucus. Marine Ecology Progress Series 307: 69-84. Stier, A. C., McKeon, C. S., Osenberg, C. W., & Shima, J. S. (2010). 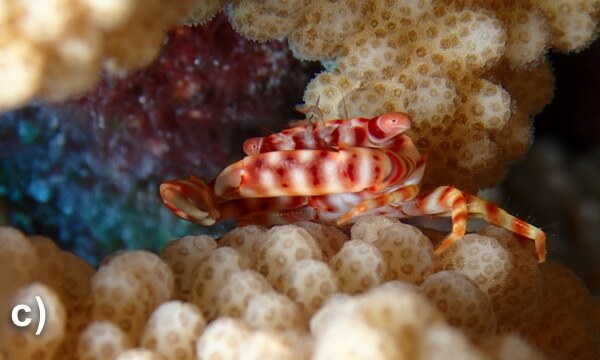 Guard crabs alleviate deleterious effects of vermetid snails on a branching coral. Coral Reefs 29: 1019-1022.